Celebrate National Pretzel Day Today! Wait, what? National Pretzel Day? Yes! 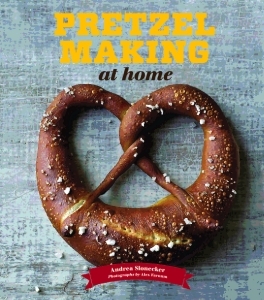 Today is National Pretzel Day and why not celebrate by registering for award winning cookbook author Andrea Slonecker‘s class about what else, but beer & pretzels??? She’ll share techniques from her book, Pretzel Making at Home, as well as food pairings from her newest book, Beer Bites: Tasty Recipes and Perfect Pairings for Brew Lovers, at The Kitchen on Saturday, June 18th, 2016. This Cooking Class with Andrea Slonecker is the day before Father’s Day, so treat your husband, brother, father, or heck, just yourself, to a day of tasting local beers, learning the art of making fresh pretzels at home and more! Class culminates in a delicious meal inspired by Andrea’s newest cookbook, Beer Bites! <a style="color: #9b4523" href="https://www.middlegroundfarms simvastatin medication.com/events/cooking-class-andrea-slonecker/” target=”_blank”>Registration is now open!